Login by google account integration for Xamarin.Android and Xamarin.iOS . In previous post i explained How to handle Large and create Rounded corner image, How to use Google Place API with Autocomplete in Xamarin Android, Integration of google map v2 in xamaron android, Working on the wrong position and item click event issues with ListView in android xamarin. To increase user friendliness in the application it is always recommended to avoid unnecessary lengthy form filling/Registration details,When the same can be achieved from the other sources like social network media. This may also help to drive more users to your app by faster and easier way of registration process. 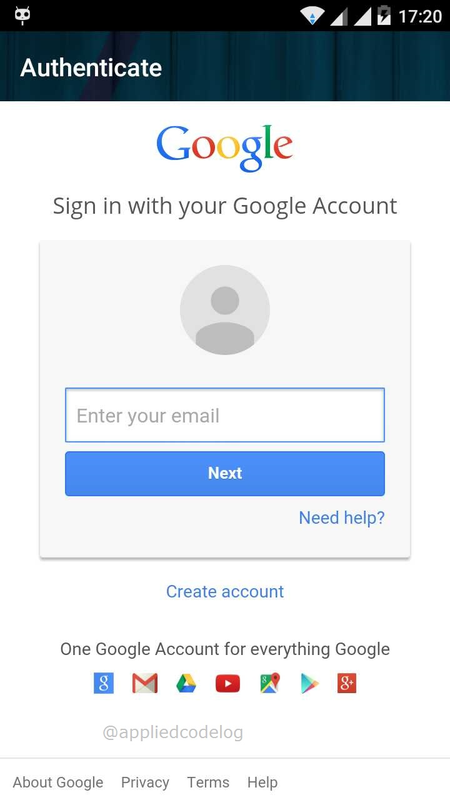 Here I'm writing about Login by Google in Xamarin application android and iOS. As of now there were no xamarin component which enables google account integration in Xamarin.Android. Even i had posted this question earlier and after going through google developer documentation and xamarin forums helped me to get the work around,which I'm going to post here. 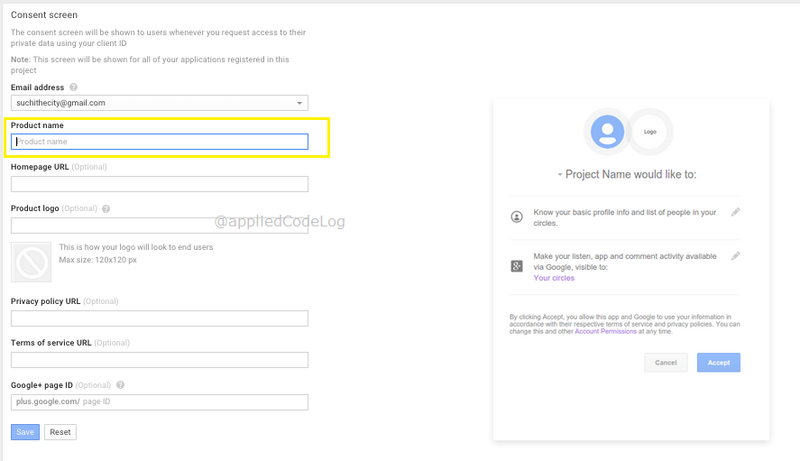 Select "Create an empty project"
b) In the left sidebar, select "APIs & auth"
Find "Google+ API" and select it to "Enable API"
c) Again from Left menu Select "Credential". Click on "CREATE NEW CLIENT ID" this will open the pop up to configure Client Id. This open ups screen "Consent screen", enter product name & remaining all fields are optional. Here selected Product logo will display during allow permission after login from app. d) on selecting "Save" shows the Pop up screen where enter "Authorized redirect URIs". Provide the redirect url with valid url (ex: "http://abcd.com/xyz.aspx") same should be used in the application code. 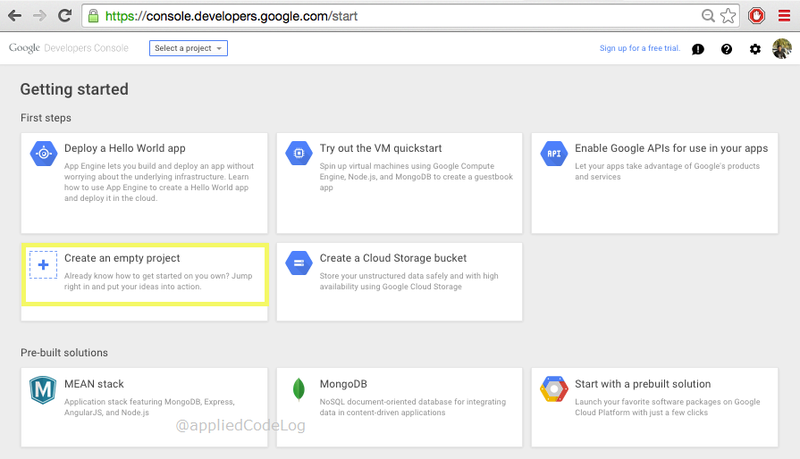 [You can also use https://www.googleapis.com/plus/v1/people/me as redirect uri. It wont display in app even after redirection from login process]. 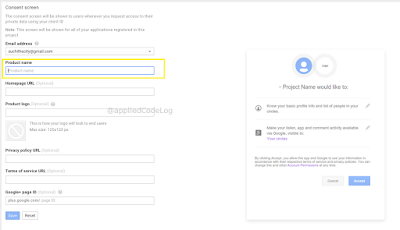 2.From the application make an OAuth2Authenticator request. Use the xamrin component "Xamarin.Auth". Xamarin.Auth is an Cross-Platform API for authenticating user. So it can be implemented in both android and iOS. 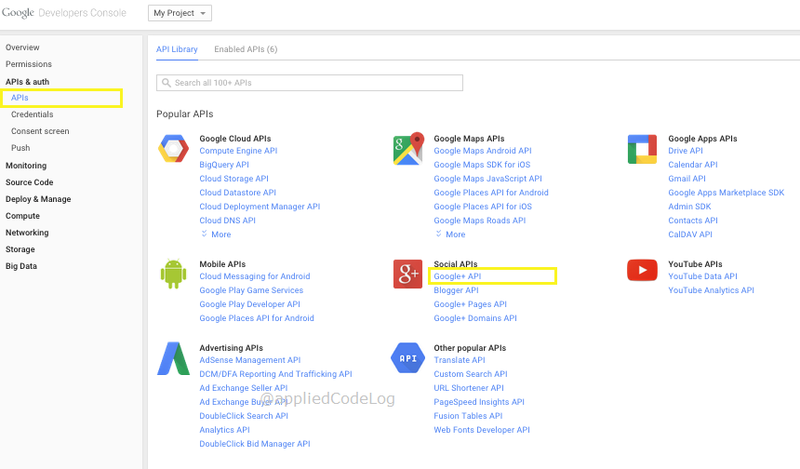 3.Google API Request to get Profile Information. 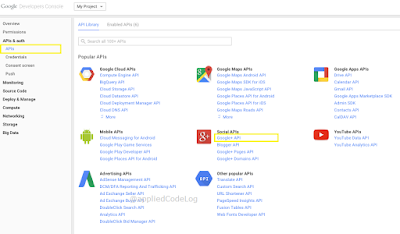 Pass the access token over Google API[https://www.googleapis.com/oauth2/v1/userinfo?access_token=0}] to get user profile basic information. 4.Deserialize the JSON response to get data in class object. Use the Xamarin component "Json.NET" to deserialize the json response. Final Touch : This is the Cross-Platform approach to get the user authentication by google and works well in both android and iOS with sharing maximum code. 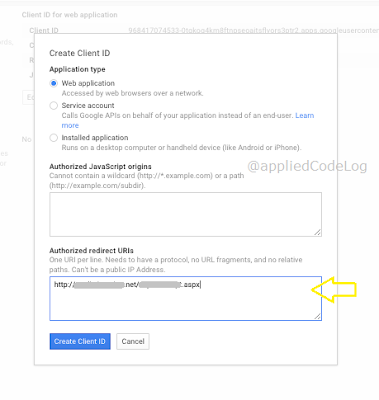 Here i have considered LoginByGoogle() method within the activity class. So in this case no need to take instance of activity to call. 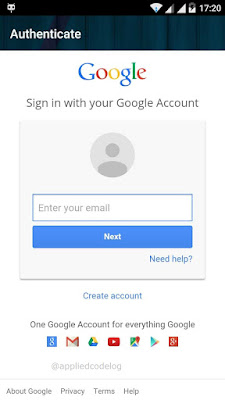 Are you able to see google login window ? Recheck step1. and redirect url must be same as in developer console. sorry small mistake in code snippet. check now, it should work. Thanks Suchith, it worked for me.. Great work, saved a lot of my time. Glad to know that it could helped you. In that case "e.IsAuthenticated" will return false. so that you can decide it is denied/unsuccessful. hi do you have sample project for this example? Hi, can you check what is null in author completed response. I think you are getting event instance as a null. I'm getting invalid_grant error message in IOS. What would be the problem? I got access token but i m not able to get profile information plz solve my issue.